NME reports on Aug. 10 that the “1979” hitmakers posted the clip on Thursday via YouTube. The live performance of “Solara” was filmed during an intimate concert held June 27 in Los Angeles at The Troubadour prior to the launch of their reunion tour, which kicked off July 12 in Glendale, Arizona. The location of the gig at the famed West Hollywood club remained a mystery until 24 hours before showtime and was held in front of 400 lucky fans fortunate enough to get tickets. 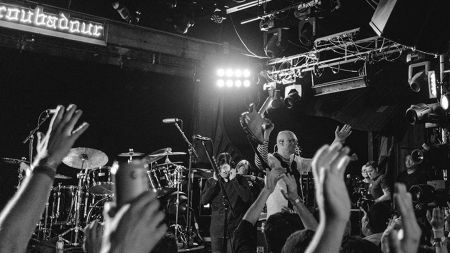 It marked the first time that Smashing Pumpkin's original members Billy Corgan, guitarist James Iha, and drummer Jimmy Chamberlin had performed together on stage in nearly two decades. The Smashing Pumpkins recently celebrated their 30th anniversary with a star-studded show on Aug. 2 in Holmdel, NJ, which featured a surprise guest appearance from Corgan's ex-girlfriend Courtney Love. The Shiny And Oh So Bright Tour continues on Aug. 11 in Columbus, OH, at Schottenstein Center and will wrap up Sept. 9 in Edmonton, Alberta, at Rogers Place. Grab your Smashing Pumpkins tickets now at AXS. Check out the live performance of “Solara” at The Troubadour above. For all the latest details on Smashing Pumpkins, click here.